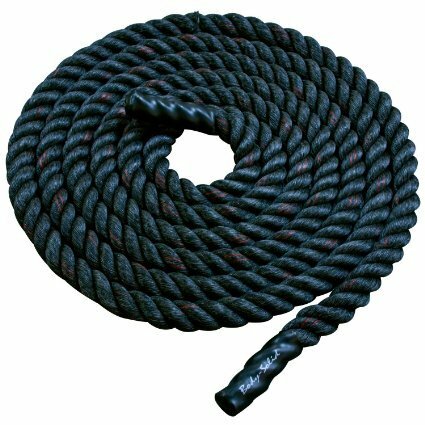 Body Solid Fitness Training Rope ColorSize - Black - 50 ft.
View More In Jump Ropes. Body focus: Balance, biceps, cardio interval training, combat training, delts, dynamic stretching, forearms, shoulders, traps and wrist. Exercises: Shoulder press, barbell thruster, burpees, alternating rope waves, rope circles, rope claps, rope double arm slam, rope double arm waves, rope figure eights, rope jumping jacks, rope slam jumps, rope snakes and rope uppercuts. Wrapped finished ends. Made from durable poly-twine. Diameter: 2 in.. Length: 50 ft.. Rope training is growing in popularity in particular with professional athletes, personal trainers, health clubs, and home fitness enthusiasts. Fitness Training ropes are portable and can be used anywhere for both indoor and outdoor training. Training can be done with individual users or couples and is usually very intense involving the use of multiple muscle groups simultaneously while increasing overall strength, hand strength, and cardio endurance. If you have any questions about this product by Body-Solid, contact us by completing and submitting the form below. If you are looking for a specif part number, please include it with your message.